Most IoT systems for the home operate on a "remote control" paradigm. Here we have a more insightful approach, one that makes "Sense". Read more about this crowd funded platform that is as smooth as Silk. I wrote last year about the latest wave of smart homes that are designed specifically for the elderly population to enable them to retain independence whilst also living safely and securely. Of course, with that number of devices and sensors, there becomes an issue with control of them. A new product by Silk Lab aims to make it easier by not only centralizing control into one device, but also using AI and facial recognition to understand your behaviors. The device, known as Sense will be capable of detecting the presence of a user and understand their voice and gestures to allow it to predict their behaviors and habits. For instance, it might be able to predict what lights you’d like turned on or your favorite music at particular times of the day. It will also use facial recognition software to understand who’s in the house at any time, thus providing a security service. The service also offers homeowners a secure video feed of the home that can be viewed from selected smartphones. The device is operated locally rather than from the cloud, which the team believe makes it a more secure option than other vendors on the market. It’s certainly a nice looking option for what is a rapidly growing market. Check out the video below for more information. The company is planning to start shipping Sense later this year, and is currently crowdfunding on Kickstarter, where they have already surpassed their goal and raised over USD 150,000. 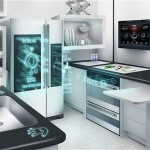 How else can developers make the Internet of Things more practical for everyday use?